Shimano is the major company making Brake / Shift levers for mountain use. Please read these reviews in the order presented, so we can avoid explaining the same principles with each of the three items. We chose top write about the XTR first because it is the longest in production of the 3 and wanted to discuss how the Rapid Fire shifter has changed in the current Optical Gear Display version. Incidentally this the last year the M900 will be made. 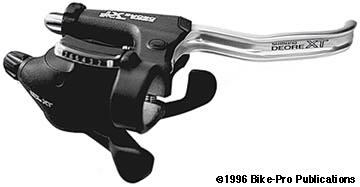 For 1995 Shimano will introduce an OGD version of the XTR brake/shifter. We want to remind you that all indexing systems for shifting reside only in the shifter. Any rear derailleur can be used with any indexed shifter, there are some very fine adjustments that are invisibly built into "systems" but the indexing will function with any index shifter. Some makers of bike parts have chains and rear gears that might add speed to achieving the shift. These Shimano shift systems are designed to use the industry standard of 4.8mm spacing on-center between rear sprockets. They will work with any rear changer, chain, or cassette...no matter who made it. First read the review of the M900 lever set, we are going to refer to it through out this review, largely because both levers solve the problems the same way. The brake lever and the clamp sections are forged of aluminum. The brake lever uses the "servo-wave" principle found in the M900 levers and it is employed the same way, using a cam following set of rollers at the end of the pin which holds the Black plastic cable anchor. One of the two cam sets is again a plastic piece that fits into the clamp section at the forward side of the lever and held by a machine screw. The cable anchor again fits deep into the housing so cable pull is actuated much faster than traditional pulling systems. The handle is held in the clamp like the M900. A machined steel bushing passes through the housing and handle, with a 2mm set screw turning into a detent in middle of the bushing. The XT's lever return spring doesn't use the telescope type found in the M733 or M900. Instead it uses a coiled spring around the pivot in the style used by most brake levers, (SS-5, SS-7, Logic). One end of the spring sits in a hole in the handle while the other end pushes against the inside of the housing. The lever uses the same reach adjuster found on the M900 and the same cable barrel adjuster and fixing nut. The 6mm by 1mm fastening bolt has a 15.5mm length, a 5mm hex fitting, and a 3.5 gram weight. Though the handle appears to be Silver as though its left clear anodized, it is really painted in a Pearl Silver color. The Carbonworks XTR, XT handle can again replace the XT M737 handle. The original weighs 32 grams and the carbon version weighs 18.5 grams. The shifter systems, front and rear operate the same as those used in the M900. These are slightly lighter through the more artful use of plastic., and a mechanical change is made in the internal ratcheting system. All external parts of the shift case are made of molded plastic, including the "OGD". Shimano has the position plate, (which was a separate piece enclosed by plastic case pieces in the M900), forged as a part of the clamp assembly. Making it this way, means the metal structure is all in the lever clamp piece, saves steps, expense and weight. The shifter systems are held to the lever by a custom bolt. The new feature of the M737 XT shift system is the "Optical Gear Display". On the left shifter there is a visual indicator of the chain ring being used. A "1" in the display indicates use of the inner chain ring, while "2" is the mid and "3" is the outer. On the right shifter, the visual indicator shows which rear cog is being used. The display shows "8" when the chain is on the smallest cog and "1" when it is on the largest (lowest gear) cog. The Shimano information states that the shifter will only advance up to three positions on a full push of the lower right lever. We found that it actually shifts across four cogs not three, and appears to have been a typographical error. The OGD works because of a post that descends from the display unit and fits into a white nylon wheel that rotates with the internal shift winder. As the shifter winds one direction it rotates the post which rotates the Red indicator. Shifting the other way moves the post and indicator back again. The Optical Gear Display on either lever is made almost entirely of plastic and designed to be easily replaced. The same shift cable barrel (convenience) adjusters on the M737 are the same used on the M900. The M737 set comes with a well constructed, heavy duty brake cable set with Black housing weighing 166 grams. 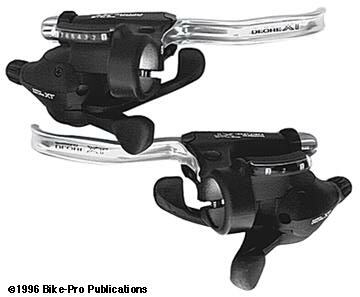 Shimano also includes a shift cable set and matching Black housing weighing 89.5 grams. These seem to be the same cable sets used in the XTR version with Black rather than Grey housing. The left lever, complete, with brake and shift functions weighs 198 grams of which 99 grams is the shifter mechanism, its bolt and the display. The right lever complete, with brake and shift functions weighs 188 grams of which 93.5 grams is the shifter mechanism. The total set weight is 641.5 grams.